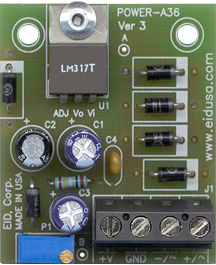 Two versions of a dual polarity power supply with printed circuit board artwork. The supplies are built around the popular LM317 & 337 complementary voltage regulators which offer very high ripple rejection as well as short-circuit and thermal protection. An interesting website with many photos of electronic projects. There are not many projects but the description and photos and documentation are very useful for learning the art of circuit design. 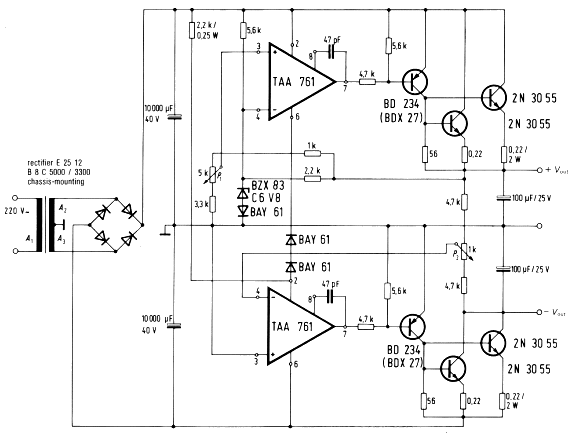 The standard buck regulator circuit delivers a +5V output. 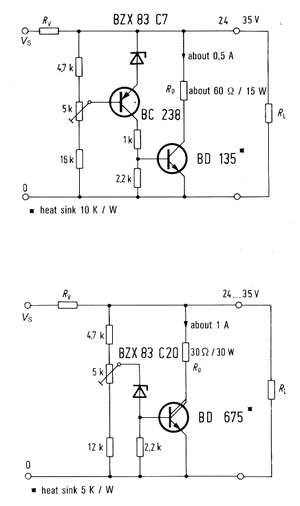 This is a rather straightforward circuit and will operate with a wide spread of component values. Optimal values should be selected however to get minimal ripple, minimal noise to the power source, maximum efficiency etc. Note that the quiesent current is about 10 to 14mA. Here is a nice way of using this regulator, this can be used for CMOS opamps as you have a -5V too. That means a portable instrument may find this design useful. The Spirit of Hacking and Fixing, Giving back Life to Old Instruments. This is a simple charger you can build for devices. It can be modified for any device. This may need no modification for devices that are charged using PC USB port. This is a Schematic Doodle called Schoodle. Use it for Learning and understanding. Build and test only when you have practiced and gone beyond simple electrical and electronic circuits. Mistakes can damage your portable device or even waste your components. Hence take care, work systematically, not like me. See the mess i have created below. The fig. 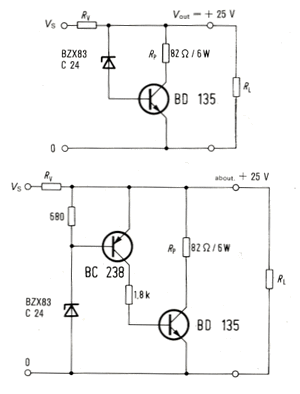 6.2 shows the circuit of a regulated power supply for +/- 15 V and 5 A. The output voltages are adjustable between 12 and 17 V.
A tape-wound core transformer is used. It offers a better power-to-volume ratio than conventional ones with laminated cores. The voltage control is achieved by two series transistors, connected in parallel, and by the opamp TAA 761, which acts as control amplifier. For the negative voltage the ground potential serves as reference level for the desired-to-actual value comparison. The voltage is adjusted by the potentiometers P1 and P2, whereby the center tap of P2 is set firstly to 0. Then both output voltages can be adjusted symmetrically through P1 (range between 12 V and 17 V, for instance). NPN power-transistors are used as series-control components for the positive as well as negative voltage. Since two transistors 2N3055 have to be connected in parallel for each output voltage, 0.22 ohm resistors are inserted in their emitter leads to achieve a symmetrical load splitting. Parallel-controlled circuits operate as self-controlled, variable resistors, connected in parallel to the load impedance (parallel loads). They react extremely fast and also control immediately pulses and very short mains break-downs, resulting from strong loads. These devices are preferably used in TV receivers, which have a B-class operated audio output stage. Without any parallel control the picture width is influenced inconveniently by the rhythm of speech and music. However not only in TV receivers a parallel control circuit is advantageous, but there are also a lot of applications requiring such a design. The parallel control circuit can also be described as a “z-diode booster”, which offers, however, the great advantage, that the power dissipation of the control transistor can be reduced to a quart of that of a z-diode representing the same function. Thus the collector resistor can take the total parallel-load when the transistor is switched on. Supposing that half of the voltage is available at the collector, only half of the current flows through the transistor, power dissipation of which is only a quart of the total power consumption of the parallel load. The circuits 1 and 2 are proportioned for a parallel load of </= 6 W. In many cases the former is sufficient. It is characterized by a remaining control voltage of < 250 mV. The circuit no. 2 consists of two stages and improves the voltage control to about 20 to 50 mV. The small elaborateness of only one transistor and one resistor is advantageous in many cases. The circuits of fig. 6.1 and 6.1.1 are designed for fixed output voltages. The resistance of Rv is determined on the control range, on the value of the supply voltage and on its fluctuation. The maximum range of power control is determined by the resistance of Rp (control resistor). The circuits of fig. 6.1.2 and 6.1.3 are dimensioned for a power of 15 or 30 W. The output voltage is adjustable in a range of 24 to 35 V, for instance. As it can be seen the circuit of fig. 6.1.3 employs only one transistor, the Darlington-transistor BD 675. Adjustable Output Positive Voltage Power-Supply Kit (Adj. output 1.25V to 24 VDC) is an electronics board (kit) that allows you to connect up to 30V AC or DC on one side of the board and get adjustable VDC regulated on the other side. Every lab should have a few of these boards handy. The boards will allow you to easily power all your analog components (i.e. op-amp). The Terminal Block TB connector is included and makes it easy to use. All Enclosures are in stock. Choose from Die-cast Aluminum, Plastic and Metal enclosures. We can cut, mill and drill them for you to any size and shape. Good news for the hundreds who call about the “Hammond Manufacturing” line of products! Yes, we carry the flagship racks, aluminum, plastic and metal enclosures by Hammond Manufacturing TM Electronics Group. Erlich Industrial Development Corporation – high-end computerized lab equipment, accessories and sensors.